Just because the winter season is upon us doesn’t mean you should forget about your pool. Cooling temps outside offer the perfect opportunity to think about and schedule some preventive pool maintenance so that when summer returns, you’re ready to make a splash! At Florida Pool and Leak, we consider customer education a big part of our job and work to ensure that you have the most up-to-date information regarding the best pool care possible. Tip #1 — Pump it Up! In order to ensure the cleanliness and quality of your pool water, you’re going to want to run your pool pump in order to circulate the water. Pumps should run daily for a couple of hours. Keeping the water circulating on a regular basis helps stop algae from growing. Overgrowth of algae and other bacteria can attract mosquitoes, which lay eggs and further compromise your pool’s water quality. While your pump is working to move your water, you should check your filters and filter baskets. As the pump does it job, debris will find its way into the baskets and filters. Left unchecked, this organic matter can build up and decay, which doesn’t do much for your water and can end up choking the inner workings of your filter and filter baskets. Another way to keep algae at bay comes courtesy of algaecide or shock treatments, which stay in the pool water and protect against algae buildup. These products not only prevent algae from growing in the water, but also along the sides of your pool liner and coping. Enzymes serve a similar purpose when it comes to the organic matter that can accumulate along the water’s surface. Telltale signs of these contaminants can be seen in the spring as a winter waterline ring. But, adding enzymes minimizes, and can even stop, this ring from forming during the off-season months. Both algaecides and enzymes are a smart investment when it comes to preventive pool maintenance. Tip #3 — Keep a Lid on It! By lid, we mean cover. When your pool isn’t in use, it’s a great idea to keep it covered for safety and hygienic reasons. Well fit pool covers help keep children safe from pool accidents and prevent wildlife from gaining entry into your pool. A pool cover also shields your pool from leaves, branches, and twigs, along with other natural debris, which can pollute your water. However, keep in mind that these materials will build up on the surface of your cover, weakening its durability over time. That’s why it’s just as important to care for your pool cover as it is your pool and pool water quality. 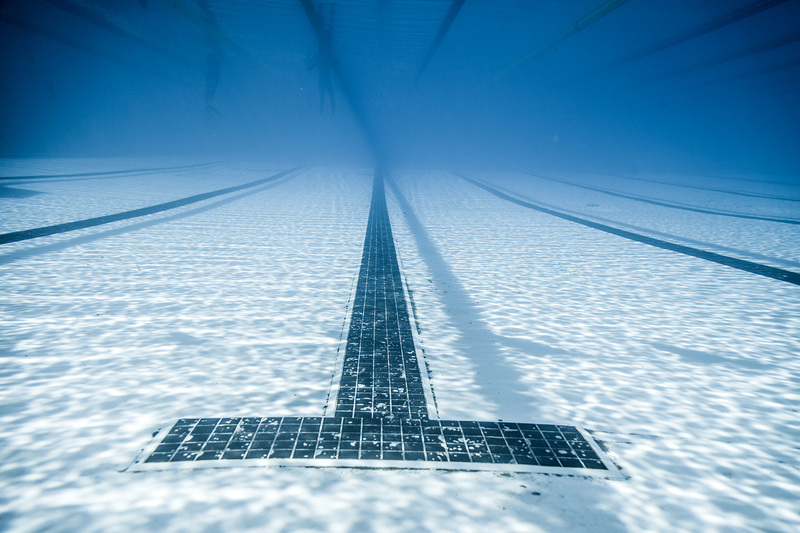 Keep it clean as part of proper preventive pool maintenance. With the rush of the holiday season, reach out and let our team at Florida Pool and Leak focus on preventive pool maintenance for you. Just a quick call or email is all you need to get started! With the new year upon us, let’s resolve to take better care of our pools. Let’s stay on top of maintenance, and avoid costly repairs that are sure to put a damper in your summer. I’ll walk you through 7 no-nos when it comes to pool maintenance. 1. Don’t neglect your pool filter. This causes a host of issues. If your filter is clogged, your pump is over-working to compensate for lack of flow. And as you can imagine, a dirty filter means algae is more likely to take up residence in your backyard oasis. 2. Don’t neglect your strainer baskets. Your pump and skimmer do a good job of keeping the pool clean, but if you fail to empty the strainer baskets regularly, you will run into the problems as mentioned in the previous point. 3. Don’t run your pump 24/7. On an average day, running your pump for 8-12 hours is sufficient. Granted, you may run it for longer after a party, but if you are running your pump all day, every day, you are unnecessarily hiking your electric bill. 4. Don’t let your pool water level drop low. Once the water level drops low, as in below the mid-level of the opening of the skimmer, your pump is taking in air. When this happens, and the pump is “running dry”, and the list of parts needing to be repaired or replaced is only growing, the longer this goes on. 5. Don’t over-fill your pool. I can’t tell you how many yards I’ve seen flooded by homeowners who started filling their pool, went in to finish that one thing, and then completely forgot to turn the water off. Put your car keys on the faucet at the hose, so you can’t drive away. Set an alarm. Or buy a water filling tool that automatically turns off once the pool is filled. 6. Don’t skip the test kit for your water. Plain and simple, if you are failing to test your water, you are just asking for corrosion of equipment and an influx of algae. Test your water 2-3 times a week, to stay on top of your water’s condition. 7. Don’t stick to standard maintenance procedures after a pool party. All those friends and party-goers, means your pool has a much higher chance of an algae disaster, post-party. Do yourself a favor, and shock your pool after big get-togethers. Don’t purchase the wrong sized filters, motors, and pumps. Making poor decisions when purchasing these essential pool parts, often leads to a lot of frustration and expense. Imagine you need to replace your pump. You purchase an over-sized pump with lots of horsepower. While it indeed will be powerful, your first electric bill will be an unwelcome wake-up call. Now that you’ve got our list of what not to do, when it comes to pool maintenance, you’re going to save yourself a lot of headache. For the most part, these common mistakes are easily avoided by small investments (i.e. pool tests), and a small amount of time each day for up-keep. Let’s start this New Year on the right foot, stay away from these pool maintenance “don’ts”. The only thing more frustrating than a leaky pool is not knowing if your pool is actually leaking. You glance out your window and see that the water level is down. Or is it? Didn’t you just add water a couple days ago? If you’ve noticed the water level in your pool dropping, or that you constantly have to increase the amount of water in it, you could have a leak. Not only is this an aggravating problem, it can also cost you in high water bills, faster surface breakdown, and could lead to sinkholes if water continues to seep into the ground. As a pool owner, checking for leaks regularly is good practice. 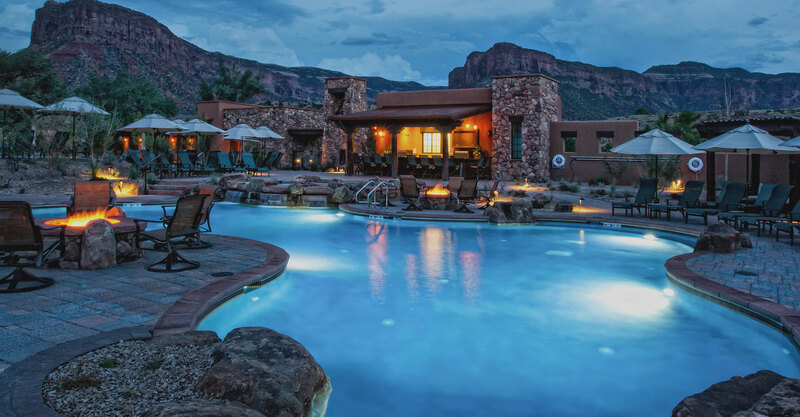 But, how can you tell if your pool is leaking or if it’s just losing water due to evaporation? Here at Florida Pool and Leak Specialists, we run a simple test called the “Bucket Test”. 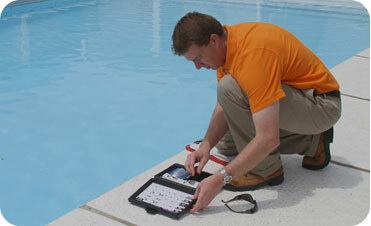 It’s an easy way that you can run the test on your pool to determine if it’s leaking or just evaporating. Get a 5 gallon bucket, and fill it three quarters of the way full with water from your pool. Put a piece of duct tape inside the bucket right at the top of the water line to mark its level. Next, mark the water level in your pool by placing a piece of duct tape on the tile (or side) of your pool at the water line. Wait! Simply leave the bucket outside by your pool and wait 24 hours. Compare water levels. If the water level in the bucket goes down about ⅛ or ¼ of an inch, that’s due to regular evaporation. However, if the water in your pool goes down more than that, you might have a leak. Consult a pool leak specialist. Trying to fix the problem yourself can be a giant headache and can seem overwhelming. 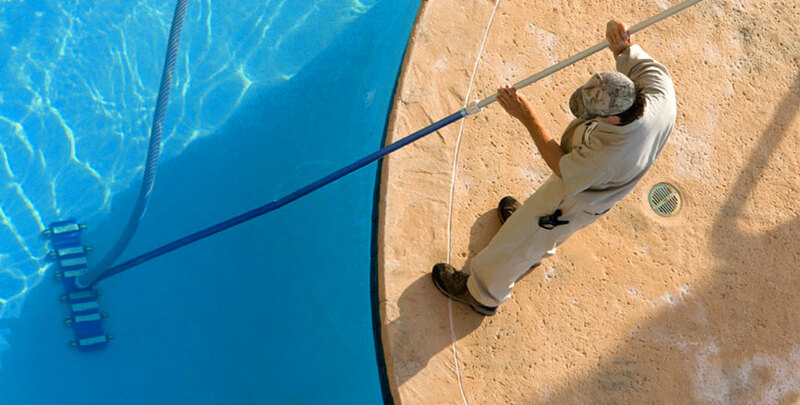 At Florida Pool and Leak Specialists, Inc., solving pool problems is what we do. We’ll help you pinpoint the source of your leak. Our skilled professionals will perform a leak detection evaluation using an ultrasonic locator, combined with pressure testing and dye tests to find exactly where your leak is coming from. Sometimes water pool temperature is cold, unlike other companies that do not enter the pool we have dry and wet suits that enable to enter every temperature of water all year round. Don’t worry, this assessment is totally unobtrusive and requires no destruction or cutting of the deck or pipes of your pool. Our team will discuss the leak issues with you and make the necessary repairs to restore your pool and stop water loss. We can also test your current equipment and make suggestions to prevent future problems. For more information, or to schedule an on-site consultation, call us today at 305-228-0880. Algae is a stubborn growth that can ruin a summer of fun in the pool if not taken care of properly. Pool owners are almost always faced with algae at some point, but with some simple prevention methods, algae blooms can be avoided. 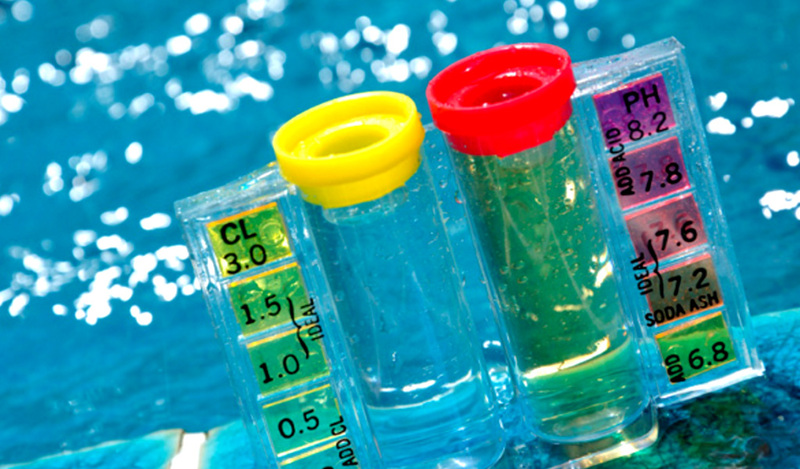 + One of the most important steps to maintaining an algae-free pool is carefully monitoring the chlorine levels. Since chlorine sanitizes the pool and prevents algae from growing, it is essential to keep chlorine levels in the desired range at all times. Automatic or floating chlorinators can greatly help you maintain the correct chlorine level but it is absolutely possible to do so without one. Test the water regularly all year long. + Pool shock and algaecide should also be used regularly. Using the correct chemicals at the recommended amount will help you prevent algae from ever blooming in your pool. Read package instructions carefully. The most common places for algae growth include pool walls, floors, and steps. These areas are also sometimes the most difficult places to spot algae so it’s important to keep all areas as clean as possible. + Get the proper brush for your pool type (Wire brushes should never be used for vinyl-lined, fiberglass, acrylic, or painted pools. These abrasive brushes should only be used on concrete or plaster pools. ), and be sure to brush once a week. 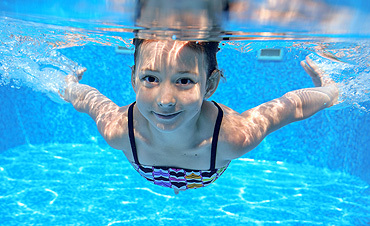 + In addition to brushing, pools must also be skimmed regularly. The surface of your pool is where algae loves to grow, so keeping a clean surface will help you avoid algae growth. Empty skimmer and filter baskets often as well. Debris in the pool can burn up your chlorine, as the chlorine will be spent trying to sanitize whatever is in the pool. It’s crucial to keep an eye on your pool year round to avoid algae as best as possible. Follow instructions to keep your chemicals well balanced and be sure to maintain a clean, debris free surface. Do you think your pool or spa might have a leak? If you’re adding more than one inch of water a week to your pool, you may have a leak. If you are unsure, visit our website at www.floridapoolandleak.com to learn how to do a simple test to determine if your pool is leaking. A leak, even a small one, can cost you more than you think. In addition to costly water bills and added chemical consumption, your leak could cause accelerated surface deterioration, equipment failures and even sink holes. It’s not just water loss! Leaks can also cause major property and equipment damage. Florida Pool and Leak Specialists, Inc. have been serving its residential and commercial customers within southeast Florida since 1998 by finding and repairing leaks to over 25,000 pools. Our uniformed, trained and courteous technicians provide extensive testing utilizing a state of the art ultrasonic pinpoint locator as well with dye testing around return fittings, main drains, lights, pool shell and vacuum fittings. They also pressure test all plumbing systems which gives us the confidence to give you the customer a peace of mind guarantee. How to Check for a Pool Leak Yourself! The summer months are busy with fun in the sun, but finding a leak can put a damper on the season. Therefore, there is help for families that want to save money when determining whether they have a leak. Try the bucket test. The bucket test takes only a short period of time to test and can save the average family inspection fees. Remember this tip, 1 inch per week evaporated is normal for a pool. To learn more about the bucket test, visit our website at https://floridaleakspecialists.com. At Florida Leak Specialists, Inc., we work to provide quality leak detection and pool maintenance for residential, as well as commercial clients.